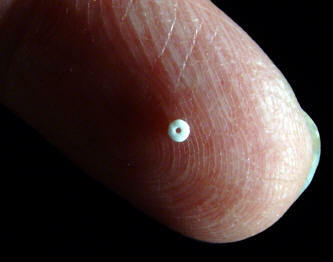 This tiny bead was discovered during the excavation of the Shifting Sands site in Winkler County, Texas. It was actually found stuck onto a chert flake, otherwise it probably wouldn't have been found at all. In fact, there may have been more of them. The material has not been identified but it's thought to be either ivory or bone. It measures about five or six dermal ridges wide. The Shifting Sands site is a bison kill and meat processing site located in western Texas. A large number of Folsom points and tools were discovered on the site. Note: If you drop this cast you may never ever find it again. I suggest you keep it in the small glass vial it comes in.